Delve into the type-2 fuzzy logic systems and become engrossed in the parameter update algorithms for type-1 and type-2 fuzzy neural networks and their stability analysis with this book! Not only does this book stand apart from others in its focus but also in its application-based presentation style. Prepared in a way that can be easily understood by those who are experienced and inexperienced in this field. Readers can benefit from the computer source codes for both identification and control purposes which are given at the end of the book. A clear and an in-depth examination has been made of all the necessary mathematical foundations, type-1 and type-2 fuzzy neural network structures and their learning algorithms as well as their stability analysis. In addition to the aforementioned conventional learning methods above, number of novel sliding mode control theory-based learning algorithms, which are simpler and have closed forms, and their stability analysis have been proposed. Furthermore, hybrid methods consisting of particle swarm optimization and sliding mode control theory-based algorithms have also been introduced. The potential readers of this book are expected to be the undergraduate and graduate students, engineers, mathematicians and computer scientists. 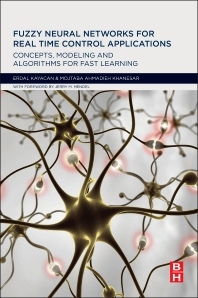 Not only can this book be used as a reference source for a scientist who is interested in fuzzy neural networks and their real-time implementations but also as a course book of fuzzy neural networks or artificial intelligence in master or doctorate university studies. We hope that this book will serve its main purpose successfully. Graduate students and engineers in the control engineering area; in particular real time control systems. Erdal Kayacan received a B.Sc. degree in electrical engineering from Istanbul Technical University, Istanbul, Turkey, in 2003 and a M.Sc. degree in systems and control engineering from Bogazici University, Istanbul, Turkey, in 2006. In September 2011, he received a Ph.D. degree in electrical and electronic engineering at Bogazici University, Istanbul, Turkey. After finishing his post-doctoral research in KU Leuven at the division of mechatronics, biostatistics and sensors (MeBioS), he is currently pursuing his research in Nanyang Technological University at the School of Mechanical and Aerospace Engineering as an assistant professor. His research areas are flight mechanics and control, unmanned aerial vehicles, robotics, mechatronics, soft computing methods, iterative learning control techniques, sliding mode control and model predictive control. Dr. Kayacan is a Senior Member of IEEE. He is currently serving as an editor for Journal on Automation and Control Engineering (JACE) and editorial advisory board in Grey Systems Theory and Application. Has published over 20 papers in international peer-reviewed Journals, and presented 25 international Conference papers. Mojtaba Ahmadieh Khanesar received a B.Sc. degree in Control Engineering from K. N. Toosi University of Technology, Tehran, Iran, in 2005 and a M.Sc. degree in control engineering from K. N. Toosi University of Technology, Tehran, Iran, in 2007. In February 2012, he received a Ph.D. degree in Control Engineering at K. N. Toosi University of Technology, Tehran, Iran. In 2010, he has held a 9 months visiting student position at Bogazici University, Istanbul, Turkey. He is currently an assistant professor in the Faculty of Electrical and Computer Engineering, Semnan University, Semnan, Iran. His current research interests are identification, sliding mode control, adaptive controller design, fuzzy systems and intelligent optimization. Dr. Khanesar is a member of IEEE technical committee on soft computing and IEEE technical committee on networked control systems. He is currently serving as a member of the editorial board for International Journal of Social Computing and Cyber-Physical Systems. He has published over 12 papers in international peer-reviewed Journals, and presented over 20 international Conference papers.